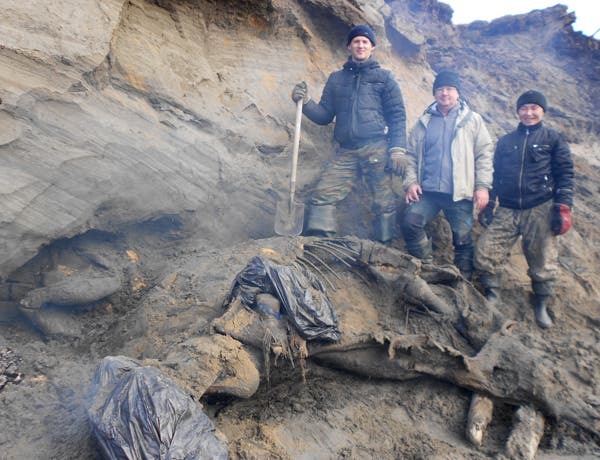 The Moscow News has reported that an 11-year-old Russian boy stumbled across the 1,100-pound, 30,000-year-old remains of a woolly mammoth shown above in the tundra of the Taymyr peninsula in northern Russia. Scientists labored for a week with axes and steam hoses to dig it out of the permafrost it's been encased in for centuries. Woolly mammoths have been found in the permafrost in Siberia since at least 1929, but this is one of the best preserved with tusks, mouth and rib cage almost completely intact. The mammoth is being called Zhenya, sharing the nickname with the boy who discovered it; officially it's the Sopkarga mammoth. There are plans for it to be studied by palaeontologists in Moscow and St Petersburg before going on display permanently at the Taymyr Natural History Museum. Meanwhile, in Japan, a team of scientists are apparently working with DNA from a carcass in a Russian laboratory to produce a clone from degraded, ice-damaged DNA.